Orphaned and disadvantaged children from Jabulani School, Simakade Primary School and Vulindlela Secondary School in Chief Mvutu’s area recently had much to smile about when Derek and Sandy Hammond, guests who recently stayed at Victoria Falls Safari Club, donated basic commodities on behalf of the Abandoned Children’s Fund (AFC). Sandy and Derek were particularly keen to reach out to children in the rural areas of Victoria Falls. Modester Bonda and Alvinoh Ndlovu from the Africa Albida Tourism human resources department escorted the couple to Lupinyu and Vulindlela villages, where they met with Chief Mvutu and the elders of the area, before proceeding to donate the hampers. 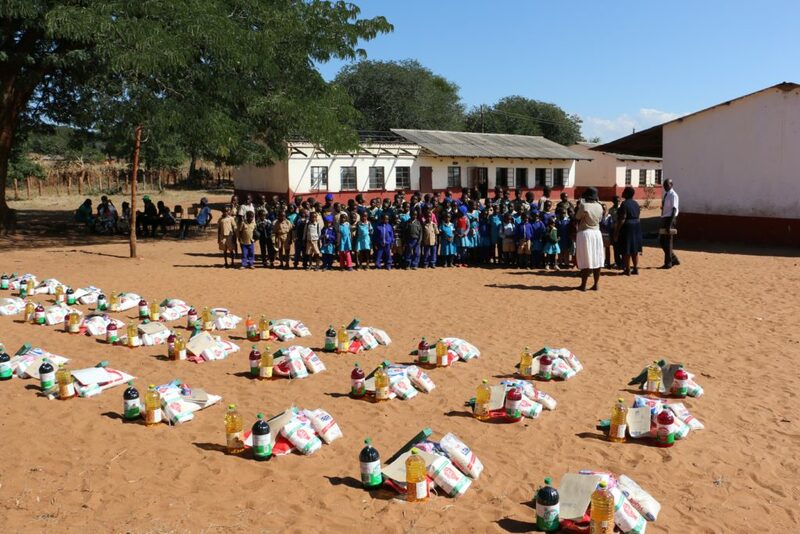 In total 40 hampers were handed out to the orphans at Jabulani School, 33 to the children at Simakade Primary School and 27 to Vulindlela Secondary School. AFC’s purpose is to rescue and restore the individuality and dignity of abandoned children throughout the world. Their programs ensure that children have food to eat, clean water to drink, a bed to sleep in and responsible adults to care for them. In addition to the basic human daily needs of orphans, AFC provides education, vocational training and mentoring programs for orphaned children so as to give them a brighter future. Chief Mvutu thanked the Hammonds for their generous donation, and the team at Africa Albida Tourism for their assistance in facilitating the donation. He also thanked OK Mart Victoria Falls who sponsored transport to deliver the goods.